This post is a big deal. Why? Well, this is the very FIRST pancake recipe I’ve posted to Anya’s Eats. It’s taken me nearly a year to share a pancake recipe with you all, because it honestly took me that long to perfect one. There are a lot of delicious, paleo-friendly pancake recipes out there. But for me, this one really tops them all. These pancakes are so delicious you could eat them plain (and I have, many times), but they are also delectable with toppings of course. 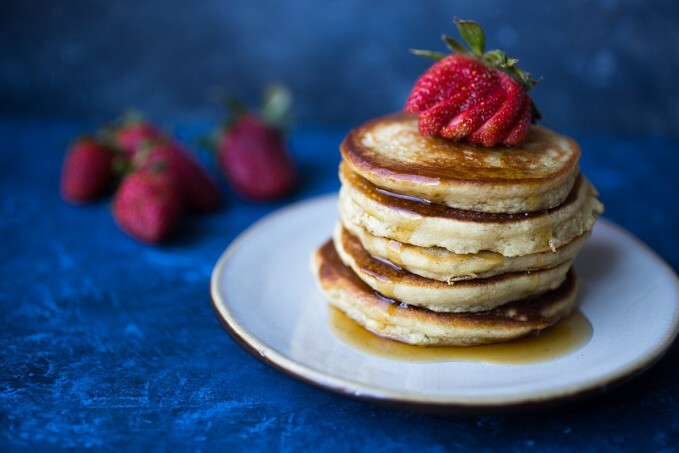 If you’re looking for pancakes that will fool most people into thinking they’re made with real, wheat flour, you definitely need to try these. They are fluffy as can be and the combination of almond and cassava flour gives them a rich, yet light texture. These pancakes are especially delicious topped with my Blueberry Compote or Cashew Cream! Combine almond flour, cassava flour, baking powder and salt in a medium sized mixing bowl and whisk until fully combined. In a blender, combine almond milk, eggs, vanilla and banana. Pour wet mixture into dry and mix well with a whisk. Heat a cast iron skillet over medium high heat and add a tablespoon of cooking fat. Once cooking fat shimmers, reduce heat to medium and use a large spoon to add a dollop of batter to the pan, spreading it out gently to create a 3-4 inch pancake. Fill the skillet with 3-4 pancakes at a time. Cook pancakes for a couple minutes on each side, check the underside of the pancake and make sure it's brown (but not burnt!) before flipping. These pancakes cook quickly so be sure to watch them carefully. Top with toppings of your choice! « The New Yiddish Kitchen Review & Shakshuka Recipe PLUS Bonus Giveaway! I love both cassava and almond flour, and I would LOVE these babies for breakfast! Just look at that fluffliness! Just made these this morning exactly as the recipe called, and they were great! My husband is gluten-free and dairy free as of the last year due to ulcerative colitis. Our weekend ritual for years was pancakes but that came to a sad and abrupt end with his health condition. I tried all sorts of alternative pancake recipes and they were just never the same as the real deal. So no more pancakes on the weekends. Today I woke up thinking, it’s a pancake morning, and we recently discovered cassava flour so I tried googling for a recipe and stumbled upon yours! It’s a winner! They were fluffy and airy like classic flour pancakes. The texture was just about the same for me to declare pancake weekends are back!! Thanks so much for sharing this recipe! I’ve made these twice now and they are fantastic! I actually didn’t have almond flour, so I subbed in tigernut instead and they were still so good! Great recipe! Ooooh, awesome idea! I’ve actually never tried Tigernut flour, but now I am super curious! Absolutely delish! I add 2T oil to the batter and made waffles. They were perfect. Hi Erin, sorry for the confusion. The oil is all for frying. Because you can’t cook all the pancakes simultaneously, you want to add 1 TBS to each batch. Based on the size of most pans, this should take about 3 batches to cook all the batter. What can I use instead of cassava flour? I have so many GF flours that I need to use what I have already. Thanks for any suggestions. Any gluten free flour that subs 1:1 regular flour would work. Question, my husband is allergic to bananas. Is there a good substitute for this recipe? I would love to try it because finding a good pancake recipe is difficult! Thanks for sharing this. Hi Carol, you could try applesauce although I haven’t done it so I don’t know how it would turn out! Carol Ray, I just made them without the banana because we didn’t have any in the house. I just added a bit more almond milk, and they turned out great! I just made this! I doubled the recipe and substituted 1/2 C plain Greek yogurt instead of bananas cus I didn’t have any on hand. I bet they’re even better with bananas! My husband commented on how fluffy they were! This recipe is my new go-to! Thanks Anya! Yay, that makes me so happy!! Will the recipe work as good if I were to subsitite a different brand of flour ? I’m not sure which flour you are referring to (almond or cassava) but, you could try. I have only ever used Otto’s cassava flour and I find Honeyville to be the absolute best almond flour out there. If you are using a different almond flour, just make sure its blanched. Hi there, I am not sure what you mean! This recipe calls for both almond flour and almond milk. These were so so good. I looked for a recipe with the ingredients I had on hand, found this and made them for breakfast. Yunmy, delicate flavor and texture and they are nice and hearty! So glad you enjoyed them, they are my favorite! Not sure, I don’t calculate the nutritionals for my recipes but you can easily plug the ingredients into something like my fitness pal and figure it out if you’d like. Hi there. You could certainly try those substations but I wouldn’t be able to guarantee the outcome either way because I have not tried them myself! We have tried paleo pancake recipes for over a year and this one is the best we have ever eaten!! Thanks so much for sharing!!! I am SO happy to hear that!! You’re very welcome, enjoy! My 9-year old said “they’re perfect!” Thanks!! Wow!! I was so surprised at how fluffy and tastey these are!! I followed the recipe exactly and they turned out amazing!! 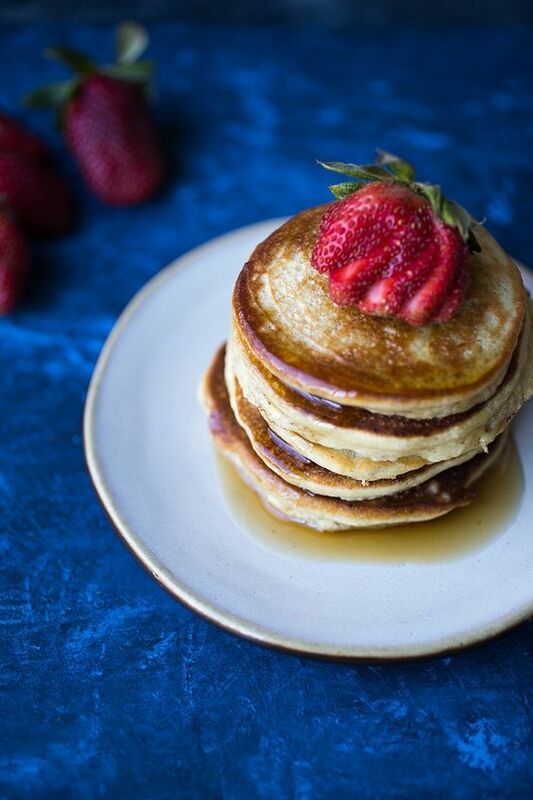 I’ve been waiting for a perfect gluten free / grain free pancake recipe as I have IBS and so many restrictions at the moment. Thank you so much for this recipe!! 🙂 from Toronto, Canada! I am so glad you enjoyed them, they are my favorite too!! I don’t like pancakes but my niece loves them and she is coming for summer break so I need gluten free. I just made them….. wonderful. I didn’t have almond milk or bananas so I used coconut milk but put 3/4 cup. Now we can have a pancakes morning.